Forum Index > Historical Arms Talk > Fabric lined scabbards. Yes/no/when? Posted: Thu 16 Feb, 2017 5:50 am Post subject: Fabric lined scabbards. Yes/no/when? I hear early scababrds were lined on the inside with fabric, sometimes even fur. I have an 18th C. encyclopedia entry detailing the making of small sword scabbards, mentioning the optional lining of the scabbard with wool. However, For 15th C. purposes (and 16th) I am told there was no fabric in the scabbards. My question now is, if there was no fabric at all, or if the lining was optional and just no terribly common. I personally like the concept of it, but I don't know if my scababrds would still be historically correct if I decide to line my 15th c. and 16th C. scabbards. Use the search function to find some existing topics on the subject, keywords (scabbard lining). I had those questions answered here, but I don't know where. I always put a lining in my scabbards, whether or not it's historically accurate. The sword draws much smoother with a lining. I use either a heavy 22-24 oz. Melton wool, or a short-hair animal hide like cow or goat. Posted: Fri 24 Feb, 2017 8:41 am Post subject: Re: Fabric lined scabbards. Yes/no/when? During the Viking period and the Middle Ages until at least the 14th century it was pretty common to line scabbards with linen (possibly also wool) or sheep skin with the fleece cropped short, I have never heard of fur being used. There are numerous surviving artefacts proving this practice from Norway/Iceland/Denmark and the UK. Personally, I prefer fleece, it is easier to draw the sword, sheathing it is smoother and it does a better job of keeping the blade from rusting although heavy wool fabric might do the same job. The "Danish two-hander" found placed on the tomb of danish King Christian I (King: 1449-1481) in 1843 was with a leather scabbard that had lærred (= canvas) on the inside rusted into the blade. Sadly the scabbard wasn't preserved into modern times. So it gives at least a historical 15th century textile example from Denmark. I've never found any historical references that show that fleece was used for scabbard linings. During the Middle Ages "fur" was used - if you mean animal hides with hair still attached. During the early Viking period longer hair seemed to be preferred, but shorter hair hides were used up until about the 10th C. After that textile linings were used. The hides with hair do add quite a bit to the size of the wood core, as the hide is rather bulky. Does anybody know of fabric lined scabbards from the 15th C.? Who's gonna know OR really care? And here's some good information on wool, and sheep. I'd be interested to know more about your word usage here. The modern distinctions between fleece and pelt and fur and wool and hair might not be reflected in period sources. Fleece is shorn wool, separate from the sheep. Pelt can be used for shaved wool still attached to the skin, or the skin itself, treated/tanned or not. Fur or hair might be used where today we might say fleece or wool. Wooly breeds of sheep were developed as long ago as Roman times, but it's unlikely that kind of fleece made its way to Northern Europe, HRE and Britain. I am not sure that archaeologists might be able to determine the difference between goat hair and sheep if it's a long wool breed or a so-called primitive breed. Anyhow, it's just my own interest due to my work. Always appreciate your research Harry. It's a very good and interesting article, thanks! But strictly speaking, while our modern conception of animal breeds may only be a few hundred years old as the writer says, the development of Ur-breeds if you will can be traced much older in certain sources, such as Roman sheep, Merino Sheep and Roman guard dogs, breed records of Arab horses, and so on. Our entire language and conception of selective breeding changed somewhat recently, but the fine wools and other selective attributes of various animals have a much longer history. The article's a nice look at British sheep, and thank god those brits really did export so much wool or they'd not have a country at all. But the history of merino, rambouillet and other southern fine-wool breeds isn't mentioned at all, though she says she'll write about merino later. I'll be interested in that. That's why I wonder, if there are any texts or surviving finds or items from the 15th C. that indicate fabric might still have been used. If it can be documented, even though rare, I'd prefer to use it. If it can't be documented, I'd rather avoid it. In general any period text, or rather any 15th C. original or analysis thereof, that gives insight into it's construction would be greatly apreciated. That depends on what you mean by 'fleece'. Where I come from that word is used both for sheep skin with the wool still attached and for the 'blanket' of wool you get when you have just shorn the sheep. In this case I meant the former. Sheep skin with the wool attached is not 'fur' to my mind, fur is things like beaver, wolf, fox, sable or mink skins or something which were generally much to valuable to be used as a scabbard lining unless you were a lord or a king or something who could afford to line his scabbard with a luxury like product like that. A fleece/hairy sheep skin lining adds at least another centimetre to the thickness of the scabbard so fabric linings may have been an effort to slim the scabbard down. Fleece/hairy sheep skin in my experience has the advantage protecting better against rust since you can impregnate it with some kind of oil and it does a better job of preventing the sword from sliding out of the scabbard. Scabbards also remained pretty chunky well into the middle ages, at least in Scandinavia. 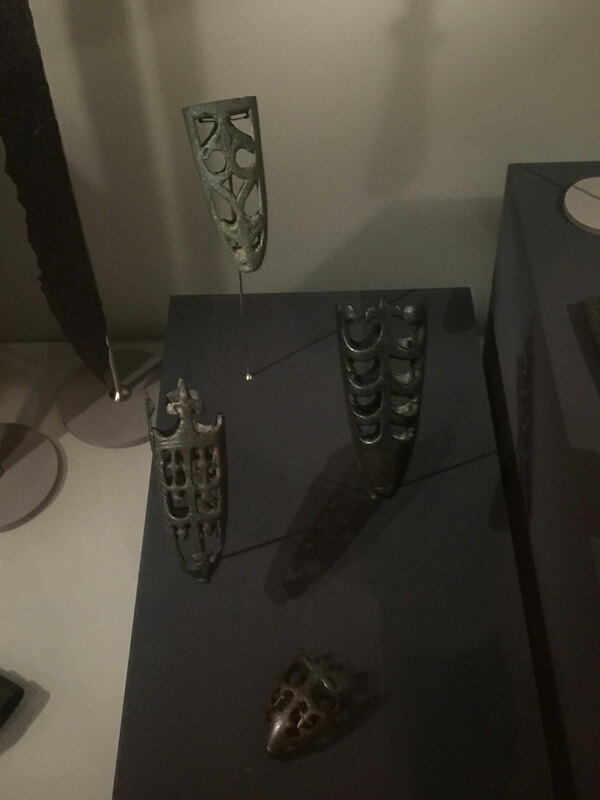 In the Icelandic national museum there are several medieval chapes (probably German or English) dating to the 13-14th centuries which indicate that scabbards were pretty chunky during this period. The opening a the top of these chapes is in 3 or more centimetres high and the scabbard would have been correspondingly thick. The longer chapes on the below picture are positively massive. Much earlier period than you're looking for, but the Sutton-Hoo scabbard definitely has some kind of fur, Paul Mortimer states that it is beaver fur in this video. If you have a good fitting scabbard, I don't think the fabric lining makes too significant of a difference. And I don't have a problem with SOME people lining their scabbards in 14th/15th century, as it is "plausible". . But too thick a lining would make a scabbard quite thick, so you should consider that. I agree, a scabbard lining with "fur" (pelt) adds quite a bit of bulk to the scabbard, even short hair linings. I'd never use a plush fleece lining for that reason. Fleece as I know it is a lamb's pelt with thick hair still attached. Next time I use a pelt I will skive the leather base of the lining to get it as thin as possible. I do this with a belt sander. Interesting observation about the switch to textile linings. Very plausible. I have seen a few well preserved scabbards from 13/14th and 15th century that were lined with what looked like wool cloth. I have not seen fleece. Some scabbards I have seen have been "naked" inside. -*But*: I have not taken these scabbards apart. This is based on just from what you can make out from peeking inside.